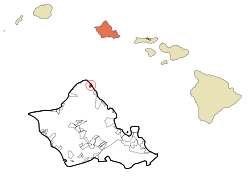 Kahuku is a census-designated place (CDP) in the Koolauloa District on the island of Oahu, County of Honolulu, Hawaii, United States. In the Hawaiian language, ka huku means "the projection", presumably a reference to Kahuku Point nearby, the northernmost point of land on the island of Oahu. As of the 2010 Census, Kahuku had a population of 2,614. Kahuku is located at 21°40′49″N 157°57′1″W﻿ / ﻿21.68028°N 157.95028°W﻿ / 21.68028; -157.95028. This community is located northwest from Laie and east from Kuilima and Kawela Bay along Kamehameha Highway (Route 83). According to the United States Census Bureau, the CDP has a total area of 2.3 square miles (6.0 km2), of which 1.0 square mile (2.6 km2) is land and 1.3 square miles (3.4 km2) is water. The total area is 57.46% water, the Pacific Ocean lying off the coast in the census tract. As of the census of 2000, there were 2,097 people, 509 households, and 401 families residing in the CDP. The population density was 2,150.9 people per square mile (834.7/km²). There were 518 housing units at an average density of 531.3 per square mile (206.2/km²). The racial makeup of the CDP was 11.06% White, 0.29% Black or African American, 0.14% Native American, 26.85% Asian, 27.28% Pacific Islander, 1.05% from other races, and 33.33% from two or more races. 8.63% of the population were Hispanic or Latino of any race. There were 509 households out of which 43.2% have children under the age of 18 living with them, 59.3% are married couples living together, 14.3% had a female householder with no husband present, and 21.2% were non-families. 19.8% of all households were made up of individuals and 11.0% had someone living alone who was 65 years of age or older. The average household size was 3.96 and the average family size was 4.63. In the CDP the population was spread out with 35.4% under the age of 18, 10.7% from 18 to 24, 23.3% from 25 to 44, 17.8% from 45 to 64, and 12.7% who were 65 years of age or older. The median age was 28 years. For every 100 females, there were 101.2 males. For every 100 females age 18 and over, there were 96.9 males. The median income for a household in the CDP was $39,135, and the median income for a family was $47,045. Males had a median income of $29,934 versus $22,366 for females. The per capita income for the CDP was $12,340. 14.6% of the population and 11.8% of families were below the poverty line. Out of the total population, 17.4% of those under the age of 18 and 17.7% of those 65 and older were living below the poverty line. The ZIP Code for Kahuku is 96731. In the mid-1970s a popular television game show, The Diamond Head Game, was contested on the grounds of Del Webb's Kuilima Hotel (today the Turtle Bay Resort), located just to the west. At the end of each show the announcer would say, "If you plan to be in Hawaii, send a self-addressed, stamped envelope to the Diamond Head Game, Kahuku, Oahu 96731." The Fox TV series North Shore was filmed there in 2004. Places of interest in the area include beaches, hiking, fishing, art galleries, and several shrimp trucks in the vicinity. Many of the people in the Kahuku community and in the football community have Samoan or Tongan roots and high school football has become quite important to them. Kahuku High School in this small, rural, coastal town on the North Shore of Oahu has produced some of the best football players in the United States. The players are regularly scouted by American colleges and universities. Many end up playing professionally for the National Football League. The Honolulu Police Department operates the Kahuku Substation in Kahuku. The Hawaii Department of Education operates the public schools. Kahuku Elementary School and Kahuku High & Intermediate School are located in Kahuku CDP. ^ John R. K. Clark (2004). "lookup of kahuku ". in Hawai'i Place Names: Shores, Beaches, and Surf Sites. Ulukau, the Hawaiian Electronic Library, University of Hawaii Press. Retrieved November 5, 2010. ^ "Profile of General Population and Housing Characteristics: 2010 Demographic Profile Data (DP-1): Kahuku CDP, Hawaii". U.S. Census Bureau, American Factfinder. Retrieved May 18, 2012. ^ "Hawaii Film Office - TELEVISION SERIES AND SPECIALS SHOT IN HAWAII". Hawaii Official Gov't Site. ^ "Go Hawaii - Oahu Attractions". ^ "The Roots of Samoans' Rise to Football Greatness". Smithsonian. ^ April 8, 2019; April 8, 2019 Updated; 2019 8:24am (8 April 2019). "University of Hawaii signs Kahuku football star". Honolulu Star-Advertiser. ^ McCracken, David. "Former Kahuku football player Kona Schwenke dead at 25". Hawaii NEWS Now. ^ "Kahuku tied for producing most NFL players - The Honolulu Advertiser - Hawaii's Newspaper". The Honolulu Advertiser. ^ "Contacting HPD Archived 2010-05-31 at the Wayback Machine." Honolulu Police Department. Retrieved on May 19, 2010. ^ "Kahuku CDP, Hawaii." U.S. Census Bureau. Retrieved on May 21, 2009.